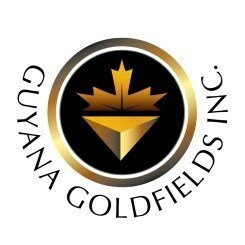 TORONTO, Feb. 11, 2019 /CNW/ - Guyana Goldfields Inc. (TSX:GUY) (the "Company") today announced the results from its fourth quarter 2018 brownfield surface exploration drilling campaign at the Aurora Gold Mine ("Aurora"), located in Guyana, South America. The Company also described revisions to the geological interpretation of the gold mineralization at Aurora compared with that which was used for the 2012 resource model, developed under prior management and which appears to have overestimated the average grade at Aurora. Further, the Company announced the approval of an approximately US$6.75 million exploration plan for 2019 covering additional surface brownfield drilling, initial underground drilling and the resumption of greenfield exploration for a combined total of approximately 30,000 metres. This is the largest exploration campaign that the Company has undertaken since 2011 both in terms of allocated capital and proposed drill metres. 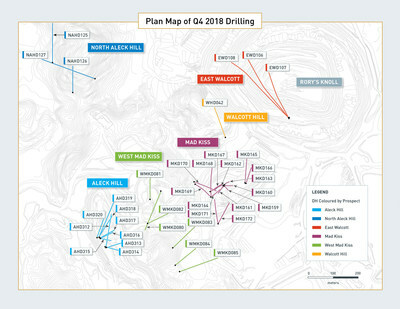 "The results of the fourth quarter 2018 program, which focused drilling toward near-mine brownfield targets following a change of exploration management last year, continues to demonstrate the potential for high-grade ore shoots beneath the satellite pits at Aurora," said Scott Caldwell, President and CEO. "Our work with Roscoe Postle Associates Inc. ("RPA") on the resource model review is continuing on schedule. We believe certain assumptions applied in the previous model used to derive open pit reserve estimates and production forecasts, including grade capping, geologic domaining and interpolation parameters appear to have contributed to the recent lower than planned gold grade at Aurora. RPA has run a number of preliminary models to determine the impact of the variables and is testing these models against historical production results. We continue to anticipate the results of this work to be completed by the end of March." 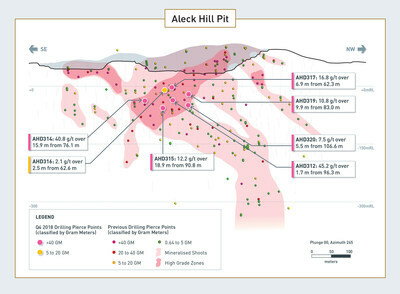 In the fourth quarter of 2018, the Company completed 5,527 metres of core in 34 diamond drill holes on targets at Aleck Hill, North Aleck Hill, Mad Kiss, West Mad Kiss, East Walcott and Walcott Hill. Highlights from this work are summarized below and a complete list of the results received to date are presented in Tables 1, 2 and 3 at the end of this release. AHD 319:10.8 g/t over 9.9m from 83.0m downhole. 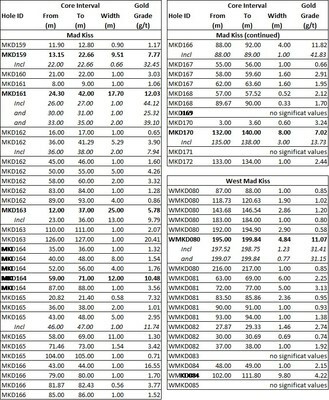 MKD 170: 7.0 g/t over 8.0m from 132.0m downhole. WMKD 080: 11.1 g/t over 4.8m from 195.0m downhole. EWD 106: 7.6 g/t over 14.0m from 330m downhole and 7.6 g/t over 18m from 365m downhole. 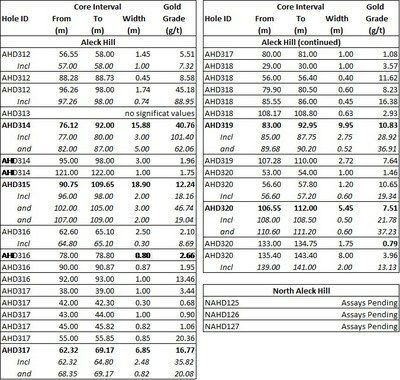 The reader should note that all gold grade averages are uncapped and all intervals are core lengths rather than true widths. The revised geologic interpretation of the style and structural controls to gold mineralization at Aurora is the result of geologic mapping of the open pit exposures, relogging approximately 50,000 metres of historic core, structural logging of new oriented core and analyzing blasthole and reverse circulation grade control results. Whereas the geological interpretation previously emphasized mineralized shear zones, the current understanding suggests gold mineralization is controlled by fold closures. Structural analysis of data indicates the folds have a steep NW plunge, similar to the character of the main Rory's Knoll intrusive. Gold mineralization, in turn, demonstrates good vertical continuity throughout the system but, outside the intrusive, horizontal dimensions are limited. The drilling conducted in Q4 2018 targeted a high grade shoot within a well-defined deformation corridor that has been traced just over 500m along a NW trend, measures 50 to 60 metres in width and had been drilled to a depth of approximately 250 metres. Nine holes were completed for 1,279 metres. The results, presented in Table 1, clearly indicate that intercepts are comprised of high-grade veins within a lower-grade background. For example, hole AHD314 returned 40.76 g/t over 15.88m core length, is comprised of two narrower vein zones of high-grade that account for 95% of the metal from just over half of the sampled interval. 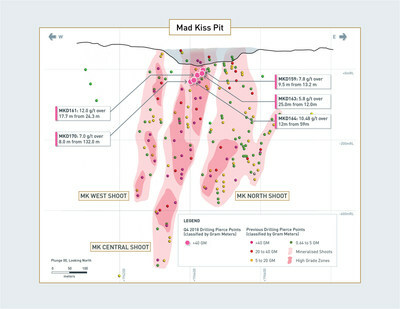 At Mad Kiss and West Mad Kiss, 20 holes were drilled for a total of 2,842 metres. A complete list of the results received from this drilling is presented in Table 2. Here, gold mineralization is hosted by a tabular quartz-feldspar porphyry dyke. The dyke strikes 240 degrees and dips approximately 700N. It has been traced 300 metres along strike, ranges in width from 2 to 15 metres and drilled to 600 metres depth. At East Walcott, two additional holes were completed for 800 metres, completing the 12-hole program, initiated in late Q2, 2018. 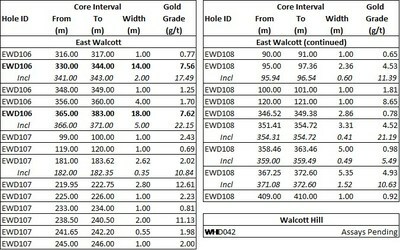 Assay results from these two holes along with hole EWD106, not previously reported are presented in Table 3. 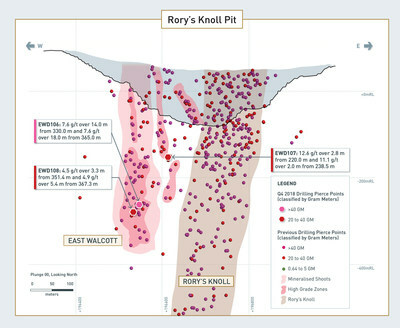 Numerous, steeply plunging mineralized zones have been identified at East Walcott, believed to be controlled by a series of tight fold closures. These shoots offer promise to develop into high-grade ore stopes for underground mining and will be further defined by both underground drilling and test mining. An exploration budget of US$6.75 million has been approved for 2019. The program consists of three phases of activity and an estimated 30,000 metres of combined surface and underground drilling. Phase 1 will be completed through the first half of the year utilizing two surface diamond drill rigs to continue to test potential high-grade ore shoots beneath the satellite ore zones at Aurora. Phase 2 is expected to commence in the third quarter, when the Company plans to commission an underground rig to replace one of the surface rigs and conduct detailed reserve definition drilling. Under the current plan, the Company will continue to drill through the second half of the year with one surface and one underground drill. Phase 3 will see the resumption of the regional, greenfield exploration activity further assessing and testing certain targets including, but not limited to previously identified gold zones at Sulphur Rose, Iroma, Wynamu, and Arangoy. Currently, data is being compiled and assessed with field work on these targets expected to commence in the second quarter. Analytical work was performed by MS Analytical of Langley, British Columbia, a commercial laboratory with both ISO 17025 (Testing and Calibration Laboratories) and ISO 9001 (Quality Management Systems) accreditation. Sample preparation and assays are done at their facilities in Georgetown, Guyana. Samples are dried, 1kg is crushed to 2mm, a split is then pulverised to 85% passing 75µm, preparation code PRP-920. Assaying is done by a 50g fire assay with an atomic absorption finish, assay code FAS-121. Samples which return above 10 g/t are given a gravimetric finish, assay code FAS-425. High grade intervals identified in core by Company geologists are assayed by metallic screening. 500g of sample is screened to 106 µm and the entire plus fraction is assayed while the minus fraction is assayed in duplicate. Both fractions use fire assay techniques with gravimetric or instrumental finish, assay code MSC-550. In addition to laboratory internal duplicates, standards and blanks, the Company inserts standards, blanks and duplicates representing 5% of assays for standards and 4% of assays for both blanks and duplicates to monitor quality control. Unless stated otherwise herein, all scientific and technical data contained in this press release has been reviewed, approved and verified by Mr. Ron Stewart (P.Geo) who is a qualified person for the purposes of NI 43-101 and is a member of the Association of Professional Geoscientists of Ontario. Mr. Stewart serves as Senior Vice President of Technical Services and Corporate Development for the Company. Forward-looking statements involve known and unknown risks, uncertainties and other factors which may cause the actual results, performance or achievements of the Company to be materially different from any future results, performance or achievements expressed or implied by the forward-looking statements. Such factors include, among others, the receipt of applicable regulatory approvals, general business, economic, competitive, political and social uncertainties; the actual results of exploration activities; changes in project parameters as plans continue to be refined; accidents, labour disputes and other risks of the mining industry; political instability; as well as those factors discussed in the section entitled "Risk Factors" in the Company's annual information form. Although the Company has attempted to identify important factors that could cause actual actions, events or results to differ materially from those described in forward looking statements, there may be other factors that cause actions, events or results to differ from those anticipated, estimated or intended. Forward-looking statements contained herein are made as of the date of this news release and the Company disclaims any obligation to update any forward-looking statements, whether as a result of new information, future events or results, except as may be required by applicable securities laws. There can be no assurance that forward-looking statements will prove to be accurate, as actual results and future events could differ materially from those anticipated in such statements.